Well, not all three camels are flying. But the one who does, high perched above the others, seems to thoroughly enjoy it. The sumptuous robes of the master and magus lend wings to his endeavor. Using his artfully twisted head and neck as rudder, he seeks out the winds of providence which will take both camel and rider to safe port. Speaking about safe port, have a look at him who is our port of salvation. Doesn't he look cute on his bed of pink flowers, legs elegantly crossed and arms extended in a noble gesture of universal invitation? For once, the adjective cute seems to apply, not only to the representation of the Christ child but to the whole set. All these figures are pretty, dainty and sweet. There is more, however. These personages exude an aura of seasoned wisdom and saintly shrewdness, so much that even the sheep seem to know what this commotion is all about. At first glance, baby Jesus and his whole company may look like the highly elaborate sugar-coating on an expensive wedding cake. A closer look reveals that these figures of hardened bread dough, intricately decorated and robed with glistening veneer, play a role not unlike Egyptian art. All flat and frontal, they have no life of their own. Their whole purpose is to show and tell the story. 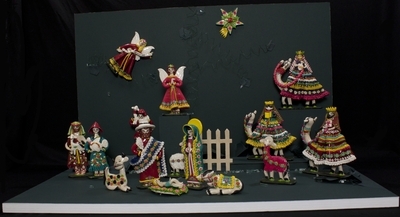 Handsculpted, painted figures made from bread dough depicting the nativity of Jesus, and created by Esthela Bedoya de Arias in Ecuador. Exhibition label originally written by Fr. Johann G. Roten, S.M. for exhibit entitled "At The Manger" and held at Roesch Library, University of Dayton.